WASHINGTON — Combat won out over caution. Trump began to view the allegations as a scheme to undermine his pick and told one confidant that he doubted Ford's credibility. 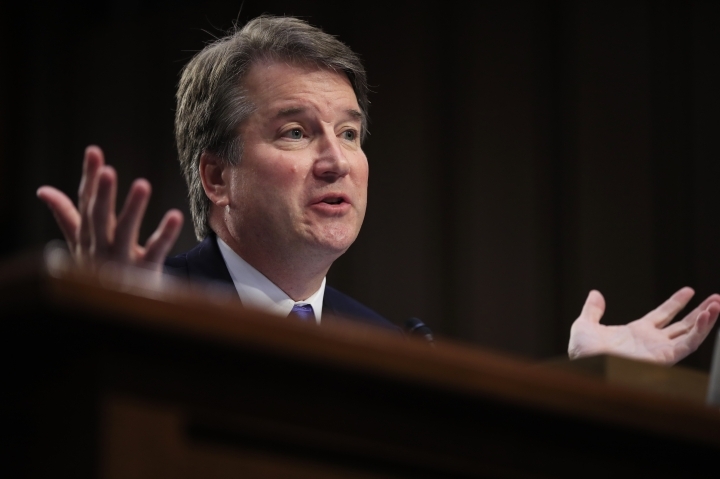 The "fake" attack on Kavanaugh reminded him of the broadsides launched against him during his presidency and the claims of sexual misconduct that dogged him at the end of his campaign. Increasingly convinced the accusations were a Democratic plot being advanced by the media, Trump tweeted that if the attack was really so bad, "charges would have been immediately filed with local Law Enforcement Authorities by either her or her loving parents." With that, he blew right past the advice of aides, who had counseled Trump to avoid attacking Ford directly, warning that it could backfire and damage Kavanaugh's chances and hurt vulnerable Republicans in the midterm elections. As is often the case with the president's tweets, this one seemed to catch many off guard. Shortly before Trump's tweet, White House counselor Kellyanne Conway told reporters at the White House there was "no reason" to attack Ford. Asked if she had been advising Trump to avoid criticism, Conway said: "The president doesn't need anybody to tell him. He does the right thing." Trump's refusal to hold back has a history. In 2015, he tweeted: "When somebody challenges you unfairly, fight back - be brutal, be tough - don't take it. It is always important to WIN!" Throughout his presidency, Trump has taken an aggressive posture, picking fights with his perceived enemies. He has complained loudly over the Russia probe and special counsel Robert Mueller. He carps constantly about what he sees as unfair coverage by the news media. He has targeted a number of potential 2020 Democratic opponents and continues to lambast former President Barack Obama. He also has gone after congressional Republicans at times and lacerated his own attorney general, Jeff Sessions. It was just that sort of Twitter-driven ire that congressional Republicans and White House aides guiding the Kavanaugh confirmation had hoped to avoid. Since the allegation first surfaced, Senate Majority Leader Mitch McConnell, Judiciary Committee Chairman Chuck Grassley and White House Counsel Don McGahn have kept in constant contact with one another, people familiar with their conversations said. The lawmakers told the top White House lawyer early on that Trump's reaction was a wild card that could undermine their attempts to confirm Kavanaugh in such a highly charged political and cultural moment. Beyond those early conversations, congressional Republicans left it up to the White House to explain the stakes to the president. White House aides relayed the congressional concerns to Trump, as Conway and other officials walked a tight rope in defending Kavanaugh while also remaining sympathetic toward his accuser. When Trump first spoke out Monday, he largely stuck to the talking points that his aides had prepared. His fairly tame response — allowing that there might be a need for a brief delay on the committee vote on Kavanaugh's nomination — had some White House aides believing they had gotten through. But it didn't last. Trump traveled to Nevada on Thursday without McGahn or chief of staff John Kelly for a rally and a bill signing, joined by press secretary Sarah Huckabee Sanders and aides Dan Scavino, Stephen Miller and Johnny DeStefano. He launched his tweets just before sunrise Friday from his gold-hued high-rise hotel off the Vegas Strip in the hours before a political fundraiser. His combative tone sent White House and congressional aides rushing to try to contain the fallout with wavering GOP lawmakers whom they feared would bend over backward to distance themselves from Trump's barbs. And aides worried that the president could unleash further attacks in future appearances. Trump has long defended powerful men against claims from women and has faced numerous accusations himself. His campaign was nearly derailed in October 2016 when a video from TV's "Access Hollywood" emerged that captured him boasting about groping women. After a reluctant apology, Trump returned to denying any wrongdoing, dismissing the claims of more than a dozen women who accused of him of sexual misconduct, and mocking some of them for not being attractive enough for him to seduce. Even as the #MeToo movement gained steam, giving a voice to women who said they were abused by powerful men, the White House has steadily denied accusations against the president and his allies. Trump backed longtime friend Roger Ailes, the Fox News executive accused of misconduct by more than two dozen women, and later hired Ailes' onetime aide Bill Shine to be his White House communications director. He publicly defended Rob Porter, an aide who resigned after his two ex-wives accused him of spousal abuse. And he backed Alabama Senate candidate Roy Moore despite accusations that Moore pursued relationships with underage women. All three men denied the allegations. Lemire reported from Las Vegas.